Its been a month or so since I have updated with a blog or E-Newsletter. In that time I have had young horse intakes and the Legacy of Legends in Tamworth. The Legacy event is always a great time to catch up with friends and colleagues from around the world and this year was no exception. The image below was of the colt that I had to start this year. The New Zealand course has been rescheduled for later in the year, a date and venue to be confirmed soon. My Australian and U.K. schedules are up on the website for viewing, schedules may change from time to time. 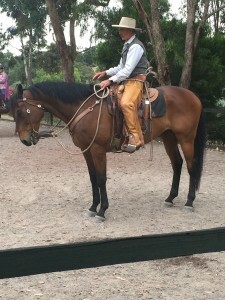 Horsemanship: Transitions are an important part in our horsemanship and riding. Transitions are relevant from riding young horses to older horses from one discipline to another to hacking/trail riding your horse out. 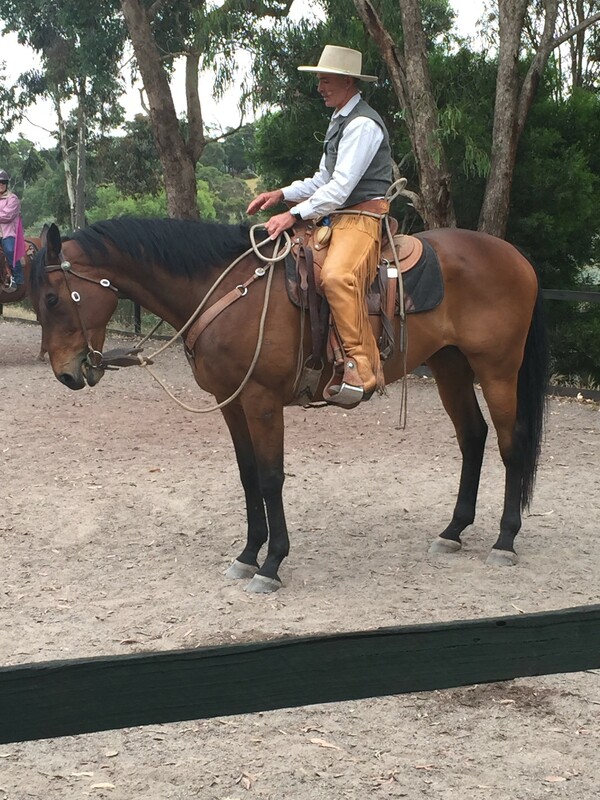 When many riders are riding a young horse they are looking to survive and perhaps have the view that they will start riding their horse well when he gets a little older with a few more rides. Why wait, ride to the best of your ability every time, your horse will appreciate it and benefit from it. Transitions will help the horse with impulsion, balance and collection, keeping the transitions smooth both up and down is also a tip for riders. At first work more on your transitions at a walk and trot, don’t try going from canter to walk while you are on the straight. In other words don’t override your horse to the extent that the downward transition becomes difficult. As your transitions become better you will feel your horse is more off the leg and seat than being dependent on the reins. For a very forward horse you may want to do your transitions more on a circle and for a less forward horse more on the straight. Hope all enjoyed the above, happy riding, stay safe and I look forward to catching up with everyone throughout the year. My travels for the year are now finished and I am now back home in Central Queensland for the first time since the end of June. There is still a colt starting course here at home in November and a young horse intake to finish the year out and with the Australian Legacy of Legends event in Tamworth to start the new year in January. In the last few sessions that I had with Ray, a couple of the points that he really seemed to be wanting to emphasis or get across was the importance of expression and getting down to the feet. The reality was that he was always trying to get those points across. It is amazing though if your horse’s feet are freed up and your horse is going forward then the horses expression is also more likely to be more positive. If your horse is going into a jump with the ears pricked forward then the horse is also more likely to jump and while I have used jumping as an example it is also true for other situations. Crossing a stream or a creek while out riding, leaving the stables or riding back to the stables may be the better example. It was always emphasised not to drill your horse on any exercises and to keep setting it up and to help your horse gain in confidence. You were trying to get the exercise done with a positive expression. As we all gain more experience and our judgement improves it is the small things that matter, the end result will take care of itself. I am now back in the U.K. and almost halfway through the schedule. Starting the schedule in Lancashire we have since been in Scotland, The New Forrest, Cumbria as well as having the first intake of horses going home this weekend. While in Cumbria last week I was lucky enough to be offered a ride in a Ferrari, this horse still prances and dances impressively. Many thanks to Tommy and Sally Spencer for their hospitality and the opportunity to be a passenger in this red horse. I have included a horsemanship article below that I trust all will find informative. When I first started, starting horses for the general public which was back in the mid eighties, horses where around 3 years of age with the odd 5- 6 year old. In recent years I have noticed a rise in the age of horses that are coming through the young horse intakes. In some cases these horses are 10 to 12 years or older in age with the average being 5 – 6 years of age. The horses are mixed from horses that have been started as 3 & 4 year olds then not ridden since, or are unable to be ridden because of bucking, not going forward or bolting etc, others have had injuries and not ridden for many years to now be deemed sound to ride. In many ways you could say that these horses are now not young horses but green horses, or in some cases, horses that are a serious challenge to ride. While I appreciate that the above scenario is not ideal and these situations occur for many reasons, it would be better if they could be prevented. For many owners & riders once they have had their horse started it is almost a case of what happens next. In the U.K. I run a hand over course after every young horse intake to help bridge the gap between horse and rider. 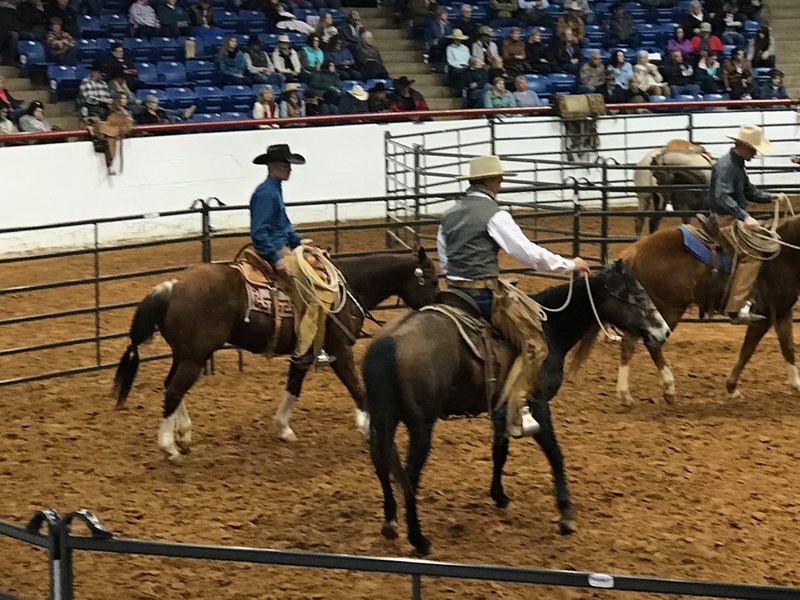 While I am supportive of riding these horses out and giving them a job to do, you still need to have a handle on your horsemanship both on the ground and in the saddle. Having observed this situation for some time now, offering a course for green horses was a possible solution. 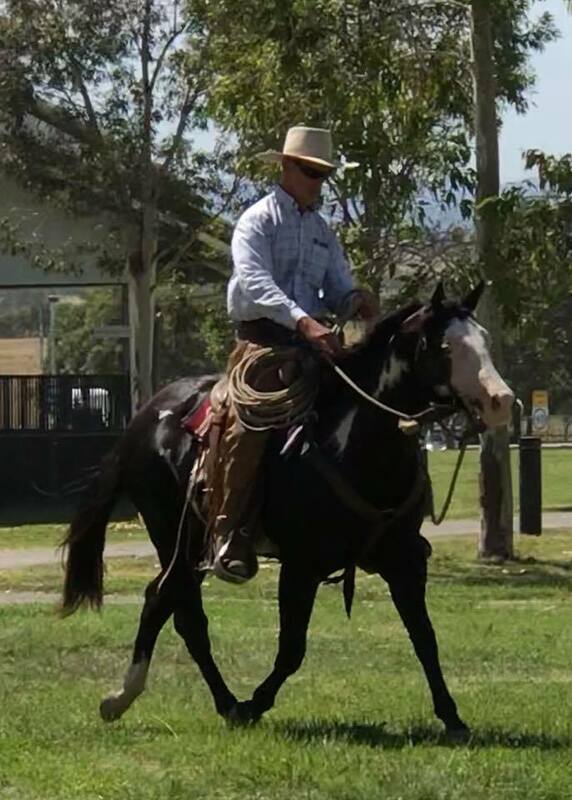 My Australian schedule is coming to an end for a couple of months having just completed a 2 day home course this past weekend plus the ongoing young horse intake. It will then be time to start to get ready to head out for the U.K. at the end of next month. During the month of April I have travelled to Bowral – N.S.W., Canberra – ACT and Serpentine in Western Australia with courses and lessons etc. It is always great to see the progress of all in my travels. Particularly for those that have been attending courses for some time, I always remember where you started from. The image above and below was a young horse start with the owner riding the young horse for the first time. This was in Serpentine, W.A. at a course organised by Horsemanship First organiser Jenny Jackson. These sort of situations are great learning for all, regardless if you are participating or watching. Every horse has the ability to learn and to teach. I have just started to put together next seasons schedule so please keep an eye on the course schedule over the next few months. In November it is likely that there will be a cost starting course here at home in Qld. This will be invitational, so please email me if you are interested. I have also added a horsemanship article below as well for all to read. Feel is such an intangible thing and what it means to you today will change over time. To get your horse to operate from a feel both on the ground and ridden is something to aspire to. Many can drive a horse but still not have the horse following a feel on the halter or feeling down to the feet. Many riders can get to where they are just pulling on the reins or lead rope rather than feeling of the horse. As a result of just pulling you may be building in resistance or a brace. In a recent conversation with a friend an observation was that when a horse steps over a pole on the ground with feel, the horse will not knock the pole. I remember Ray pointing out to a group of us one time, a horse that was not feeling down to the feet and then when the horse was really feeling with feet. It was too completely different pictures, observe your own horse in the way that they move at different gaits and in different situations. Equally before the horse moves they have to get ready to move, in this case the weight must shift. While appreciating that many have heard and read the above several times before, we do have start living this more to gain the benefits. When I started putting this blog together it was the beginning of May and now we are at the end of May. The year is flying by, I look forward to meeting up with all those in the U.K. in the next few weeks. I am now back from the spring of the Northern Hemisphere and into the autumn of the Southern Hemisphere. The past week has been spent putting up flood fences etc from the floods of Cyclone Debbie, we were lucky with no stock loses or building damage and grateful for the rain. I have again added a horsemanship article or rambling that I trust will prove helpful. The above images are from the Legacy of Legends in Fort Worth, Texas. When I was in the U.S recently I had an opportunity to spend a few days with some good people not only are they good with the horse, they have an empathy for the horse and are also good people to be around. 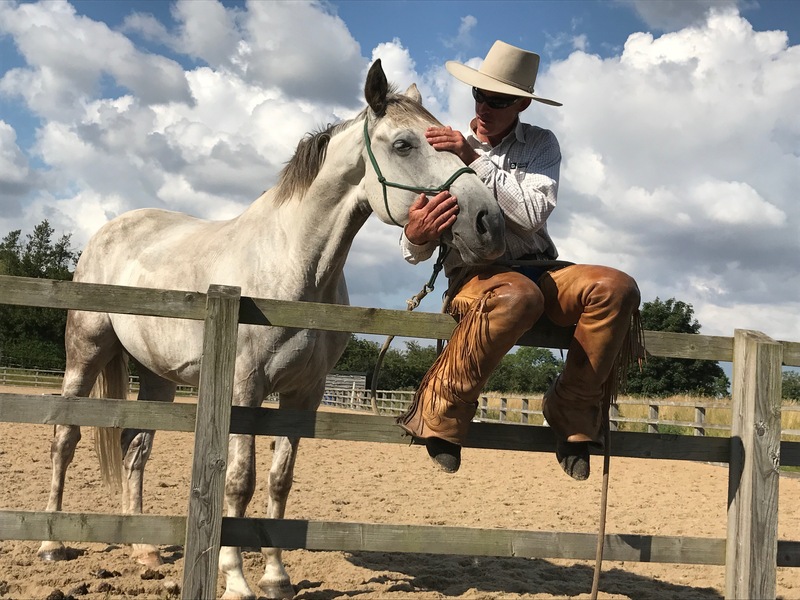 While there is always a lot to be learned when you are riding a horse, I also believe there is a lot to be learned when you are having a conversation in the evening. The more experience that a rider has around horses, good or otherwise, often the better the conversation. As riders we may not appreciate how sensitive the horse is and we can often get to where we are just pulling on the horse to try and get the horse to come to the vertical. I am sure that this is not what Ray meant, when he spoke of a soft feel. When you would see Ray ride a horse, irrelevant of the horse being a young horse or an older horse. The horse was always in balance and the flexion was appropriate. Equally Ray always looked like he was a part of the horse and in balance with the horse. The question was put to Ray one time if he had ever had any equitation lessons, his answer was no. As he elaborated he said that it was easy to ride a horse that is in balance. Equally the soft feel has more quality and weighs nothing, even if the horse is not at the vertical, they feel like you have them on a thread of cotton. The horse is operating more on a feel than a physical containment, of course for may of us this may only be for a moment or to, but that is a start anyway. These days I get a little reluctant to speak of Ray to much, for fear of misquoting him. Many have a part or an understanding of what this is about, so the above is more about causing us all to broaden our horizons and perspectives. A quote that Ray would sometimes use was that the last thing that you learn is the first thing that you need to know. Since my last website blog, I can now say that we have enjoyed some very much needed rain here in Central Queensland. Presently I have another intake of young horses in at the moment, with a couple having gone home over the weekend. This intake have a ranging of ages from 3 to 8 years of age. A couple of the 3 year olds I started as 2 year olds. To my knowledge they had not been ridden since, what I find really encouraging is that you can pick up right where you left off. I have seen this happen on many occasions now and I really believe that when the foundation is solid you have something dependable to fall back on, some horses it may take a little while for this to happen. Throughout my travels, I see situations where riders are bringing their horses back into work after a spell either through the winter weather or having turned a young horse away after starting etc. As mentioned if you have something to fall back on then it is often a non event. 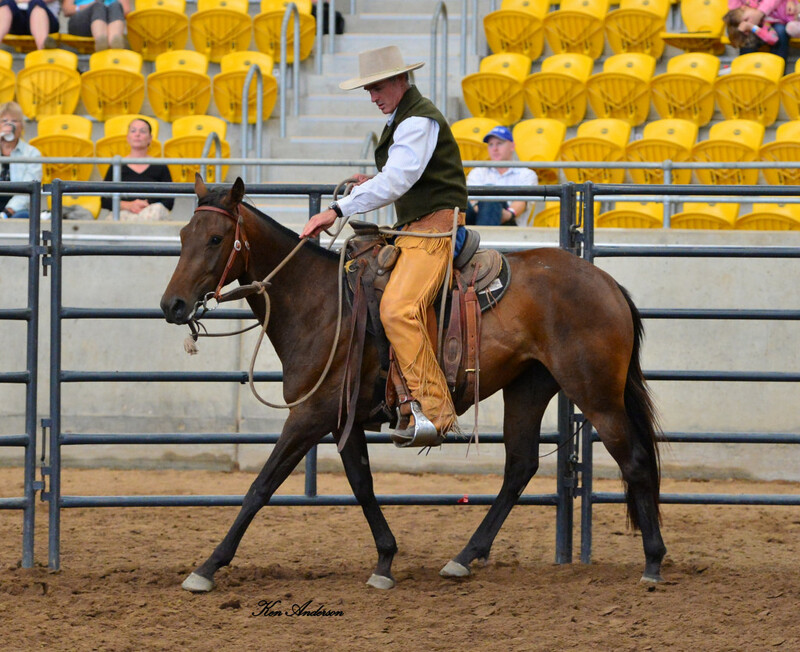 Horsemanship – The image above is from the Legacy of Legends event in Tamworth, Australia that I spoke of in last months blog. 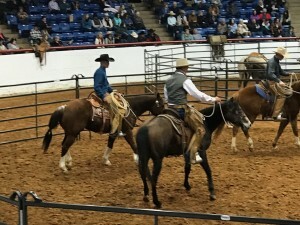 Some of the exercises that you do either on the ground or in the saddle, either starting a colt / young horse or with an older horse maybe the same or similar. As your knowledge base grows and you have more depth to your understanding then you will look at the exercises differently and be able to help the horse more with where they are at. To many, I guess it can get a little repetitive and while the message seems a simple one, there is much more to it. When you see the exercises done with feel and timing, the outcome is often very different to when the exercises are done without feel and timing. The first one of Ray Hunt’s courses that I went to in the mid eighties, Ray would have us tell him when one of the horse’s feet where leaving the ground. The last course I was at in 2009 Ray was still asking us to tell him when one of the horse’s feet where leaving the ground. Many of us know the footfalls of the horses gaits and a few ride the footfalls. Those from the jumping world will know the relevance of counting strides, but you don’t have to be a jump rider to count strides and you don’t have to wait until you are riding an older saddle horse, you can do this on any horse. It will also help your feel and timing and you can do this on the ground or in the saddle. It will help with lead changes to feeling the rhythm and tempo of the gaits and much more. Even if we are not right all the time, I believe that the fact that your horse can feel you are trying to help, they will fill in for us. January 2016 started with a weeks stay in Tamworth, Australia for the Legacy of Legends event. It was an exceptional 3 day event and well supported by the southern hemisphere audience with numbers bigger than the first Legacy of Legends event held in Tamworth in 2014. It was also great to see many friends from the U.S. make it across to Australia for this event. It may have been just to escape the winter of the Northern Hemisphere. Carolyn Hunt & Buck Brannaman have bought this event across from the U.S. with the enormous help of Anthony and Deb Desreaux in organizing it. The schedule consisted of colt starting, horsemanship, cow working and roping sessions. The image below was from the last morning session of the colt start and was of Buck helping me to get on this filly from the fence. 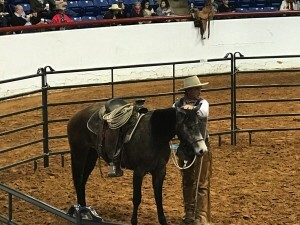 The presentation that Buck gave using this filly and explaining what was taking place was a topic of conversation for many of the audience. 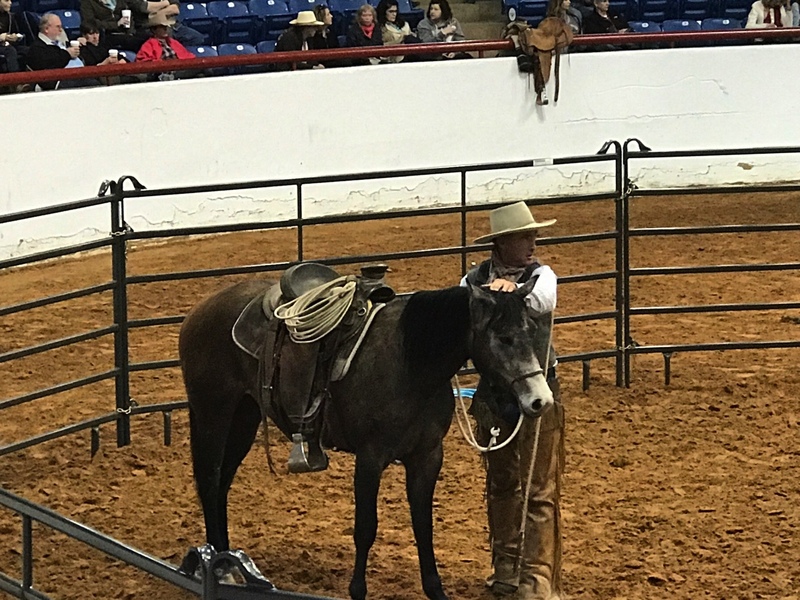 A few of the comments Buck made during the presentation were about the importance of changing eyes and not pushing and having good flexion when bringing the forequarters though plus the placement of the feet. 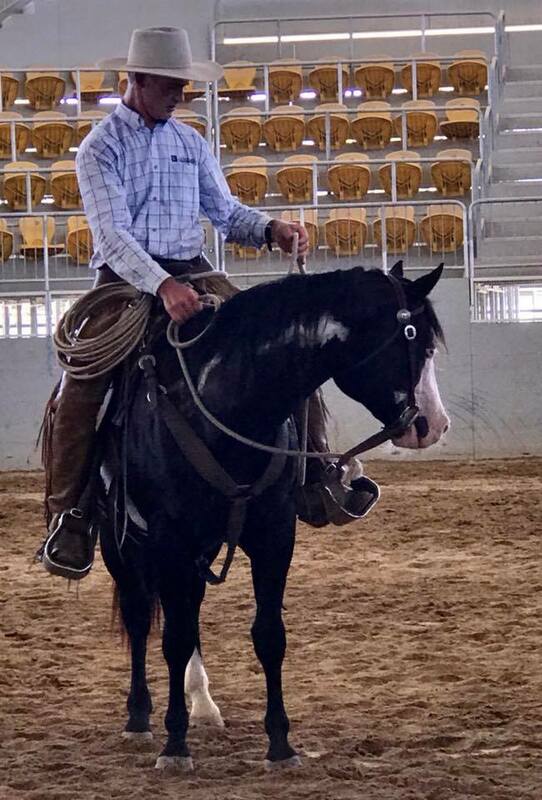 While the session did not start here and was a little western at the beginning, to feel the difference in this horse at the end was exceptional. It is difficult to put all the lessons into words and for many the lessons would have been a more visual. After Tamworth it was off to Southport on the Gold Coast in Queensland, not for the Magic Millions but for the annual state pony club conference held at the Southport Pony Club grounds. 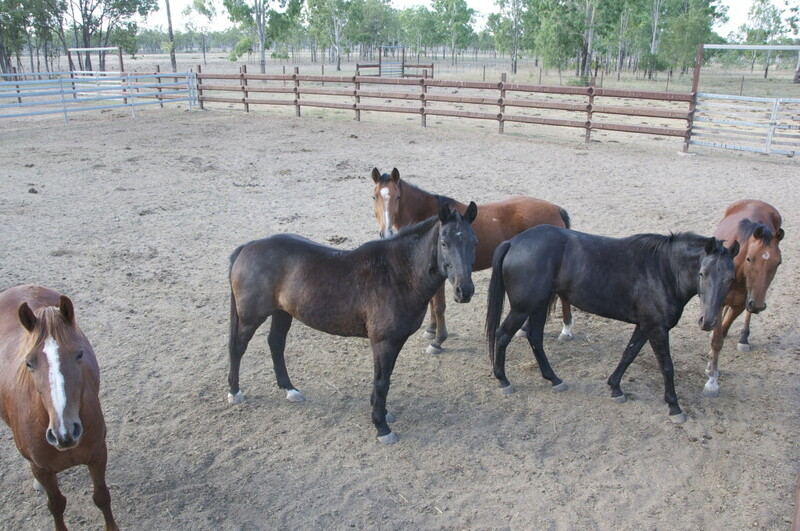 The Qld State Pony Club have been holding horsemanship courses throughout the state for a number of years now. They are to be commended for seeing the importance of horsemanship in their curriculum. I wish everyone a happy and healthy new year and look forward to catching up through out my travels during the year. Since my last website blog I have been in Perth, New Zealand and just recently returned from Melbourne. It is always good to be back in Australia and getting around this big country. I have had the opportunity to travel extensively for over 20 years and while appreciating and enjoying what many other countries have to offer. Australia is a great and lucky country with recent global events. I have now completed my course schedule for this year and start again in the new year with the Australian Legacy of Legends event in Tamworth and then a 2 day course at the annual Southport Queensland Pony Club conference. I also have another intake of young horses in February for those interested, please email me, places are limited. 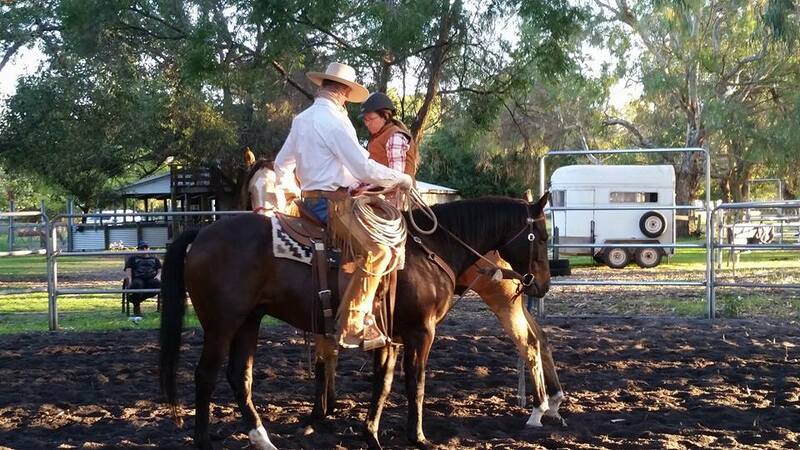 At the end of March I also have a course here at my place in Central Queensland, this is a 4 day course and will be a horsemanship and cow working course. Again please email if you are interested as places will be limited. There are also a few more courses for the Australian schedule next year that are in the pipe line so please look at the course schedule webpage for updates. The image above and below is from the week long course in Perth. The horse I am riding is one of Jenny Jackson’s horses, Jenny and her family educated us all on Alpacas and made all welcomed. The New Zealand course went very well with a very good standard and all making good progress over the course, thank you to Scott O’Malley & Michaela Coombe. The St Andrews course in Victoria was also progressive and a big thank you to Tiana and her husband Stu for their hospitality and in making everyone feel welcomed. The smaller image was of a friends horse that I rode for a couple of the afternoon sessions at the St Andrews course. At recent courses, while helping riders on many topics of horsemanship. a couple of those topics have been transitions and the other equitation. For those that are able to take on board the information you see their horsemanship make progress. While all are trying to improve as riders we still have to make sure that we are not riding with a kick to go and pull to stop approach. There is more to being a good rider than not falling off and we all do. Being able to know what your legs and hands and body are doing is very important. Some riders really struggle to isolate their legs and so while trying to use only one leg the other is active as well. Riding transitions smoothly and keeping the weight correct for the horse is another chapter and verse as well. To all that have attended courses this year and organised courses or sent horses for starting I wish you all well with your horsemanship. Have a very Merry Christmas and New Year. I look forward to seeing you again next year. I have now made it back into the office at home in Australia. All horses from the recent young horse intake have now gone home. There are still a couple of places available on the February and May intakes. Please let me know if you are wanting to reserve a place as the intakes can fill up quickly. Tomorrow I start travelling to Perth, not in Scotland, but Western Australia. This will be a 5 day horsemanship course, more details are available on the website course listing page. Next week, it is back to the South Island of New Zealand for a horsemanship and cow working course. 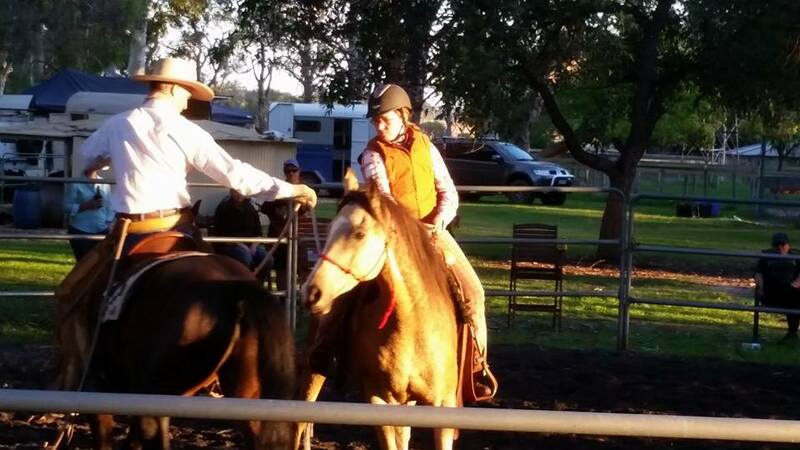 The middle of November is a 3 day horsemanship course in St Andrews Victoria. In December a 2 day course is scheduled for Armidale in N.S.W. The UK course listings for 2016 is now available for viewing on the website. Please let me know if any changes need to be made with contact details etc. 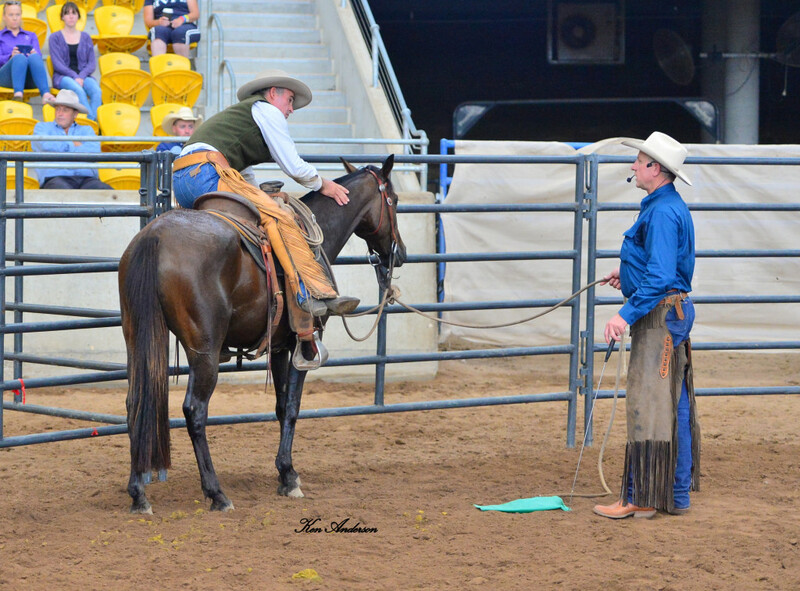 Below the image I have written a horsemanship article that I trust that will be helpful. Horsemanship is non denominational and is applicable to all disciplines and equestrian sports. It takes time for both the horse and human to learn and be solid. With the horse it is easy for us to get frustrated when we don’t pick up straight away, where we left off yesterday or last week. Most times this is just a case of things not being solid and dependable. A recent example of this was a case where I rode a couple of horses that I started last year. They were well bred and nice horses, but their self-preservation was pretty close to the surface and a lot of time was spent on getting things solid and dependable with the time that I had them for. This year I rode the same horses for a small amount of time and to my knowledge they had not been ridden or had much handling during the 12 months. It was like picking up where I left off 12 months ago, saddling and riding was a non event. Spending time on getting the foundation solid with your horses is really an investment that pays regular dividends in many forms. To understand the horsemanship takes time on the human side as well. When riders come along to courses I really try to emphasis the importance of doing your homework in between the courses and overtime you will progress. This afternoon the U.K. weather has given me an afternoon off of riding horses in order to put words to this months blog. Since my last blog I have been in the U.K. busy with courses and young horses. I am now in the final couple of weeks before leaving to start travel back to Australia via Europe and Dubai. There are still a couple of more courses here in England and then it is across to the Isle of Man and Ireland for courses over there as well. My Australian course schedule starts in October with a course at home and then Perth, New Zealand and Victoria. More details are on the course schedule of the website. In a previous blog, the Q & A format drew positive feedback and have continued with that below. Q: How do I get my horse to walk out? A: An old saying is that the walk is the mother of all gaits. In a previous lifetime the paddocks / pastures that we gathered or mustered cattle from where significantly larger than they are now. So we always appreciated a horse that could walk. I was not always successful at getting my horses to walk out in those days, these days my young horses/ colts can out walk most older saddle horses after a few rides. While on the ground I am looking at how my horses walk out and how they track up and are balanced. Many horses that riders can not get to walk out are on the forehand and not tracking up from the ground. I find if I drive my horses forward from behind the wither then this helps to encourage the horse to track up more. When the horse is ridden and on the forehand and is asked to move out more in the walk often the horse breaks into a jog or a trot. I liken this to having someone give you a slight push when you are walking down hill. If your weight is not back then you will have to break into a jog or a trot to regain your balance. When riding I also try and get my legs and body in time with the rhythm of the walk. My legs follow the swing of the barrel of the horse and try to get the walk to where it will start to swing my reins. 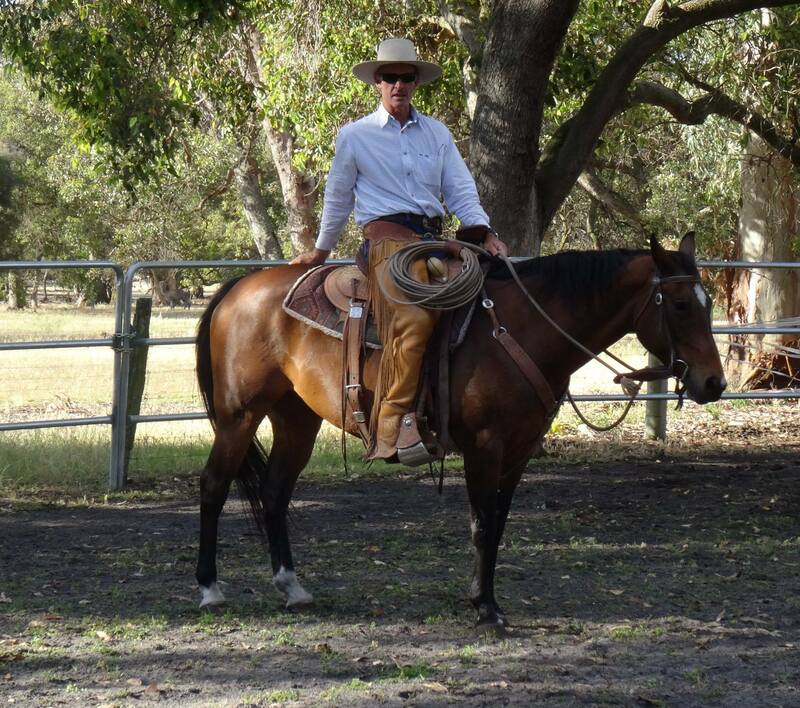 At times I will slightly increase the tempo of the swing of my reins to get the horse to get with me a little more. 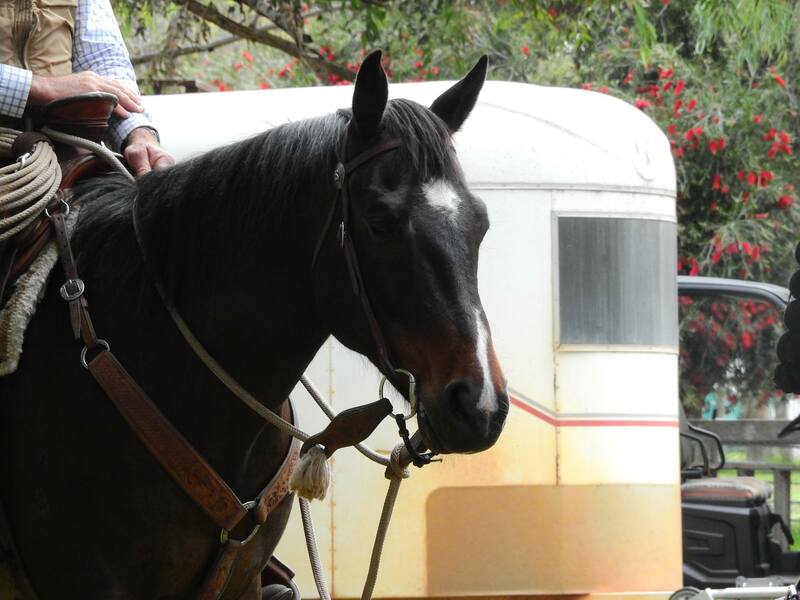 We have all ridden horses that walk well in the direction of home and can get the reins to start to swing. I like them to walk away from home the same way.